An infection may be intracellular or extracellular, depending on the pathogen. All viruses infect cells and replicate within those cells (intracellularly), whereas bacteria and other parasites may replicate intracellularly or extracellularly, depending on the species. The innate immune system must respond accordingly: by identifying the extracellular pathogen and/or by identifying host cells that have already been infected. When a pathogen enters the body, cells in the blood and lymph detect the specific pathogen-associated molecular patterns (PAMPs) on the pathogen’s surface. PAMPs are carbohydrate, polypeptide, and nucleic acid “signatures” that are expressed by viruses, bacteria, and parasites but which differ from molecules on host cells. The immune system has specific cells, described in Figure 23.2 and shown in Figure 23.3, with receptors that recognize these PAMPs. A macrophage is a large phagocytic cell that engulfs foreign particles and pathogens. Macrophages recognize PAMPs via complementary pattern recognition receptors (PRRs). PRRs are molecules on macrophages and dendritic cells which are in contact with the external environment. A monocyte is a type of white blood cell that circulates in the blood and lymph and differentiates into macrophages after it moves into infected tissue. Dendritic cells bind molecular signatures of pathogens and promote pathogen engulfment and destruction. Toll-like receptors (TLRs) are a type of PRR that recognizes molecules that are shared by pathogens but distinguishable from host molecules). TLRs are present in invertebrates as well as vertebrates, and appear to be one of the most ancient components of the immune system. TLRs have also been identified in the mammalian nervous system. The binding of PRRs with PAMPs triggers the release of cytokines, which signal that a pathogen is present and needs to be destroyed along with any infected cells. A cytokine is a chemical messenger that regulates cell differentiation (form and function), proliferation (production), and gene expression to affect immune responses. At least 40 types of cytokines exist in humans that differ in terms of the cell type that produces them, the cell type that responds to them, and the changes they produce. One type cytokine, interferon, is illustrated in Figure 23.4. Figure 23.4. 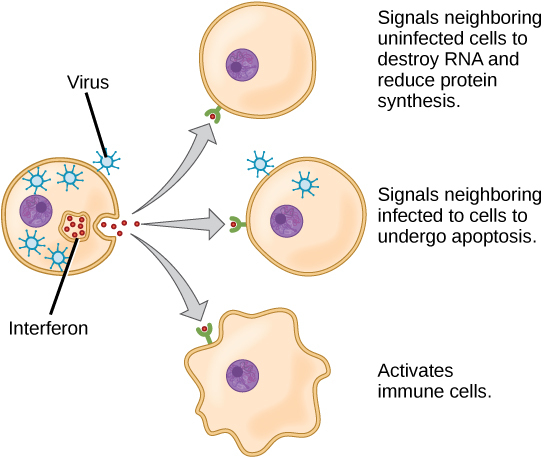 Interferons are cytokines that are released by a cell infected with a virus. Response of neighboring cells to interferon helps stem the infection. The first cytokines to be produced are pro-inflammatory; that is, they encourage inflammation, the localized redness, swelling, heat, and pain that result from the movement of leukocytes and fluid through increasingly permeable capillaries to a site of infection. 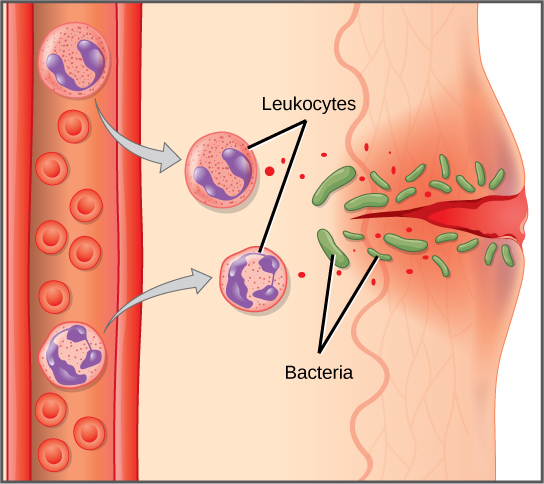 The population of leukocytes that arrives at an infection site depends on the nature of the infecting pathogen. Both macrophages and dendritic cells engulf pathogens and cellular debris through phagocytosis. A neutrophil is also a phagocytic leukocyte that engulfs and digests pathogens. 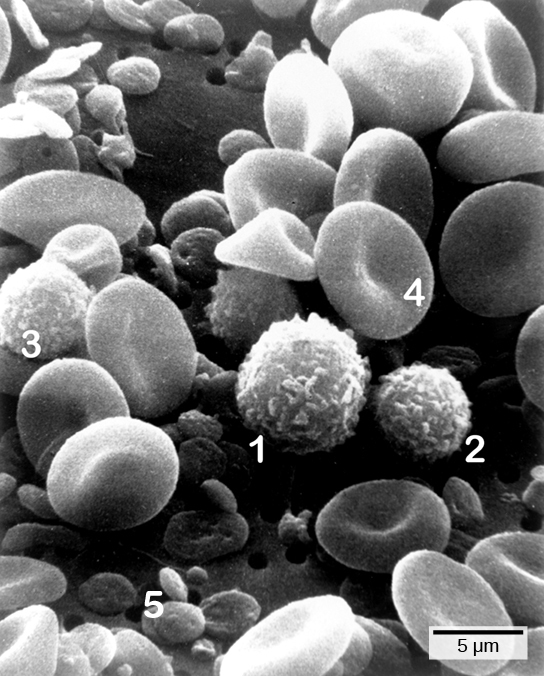 Neutrophils, shown in Figure 23.3, are the most abundant leukocytes of the immune system. Neutrophils have a nucleus with two to five lobes, and they contain organelles, called lysosomes, that digest engulfed pathogens. An eosinophil is a leukocyte that works with other eosinophils to surround a parasite; it is involved in the allergic response and in protection against helminthes (parasitic worms). Neutrophils and eosinophils are particularly important leukocytes that engulf large pathogens, such as bacteria and fungi. A mast cell is a leukocyte that produces inflammatory molecules, such as histamine, in response to large pathogens. A basophil is a leukocyte that, like a neutrophil, releases chemicals to stimulate the inflammatory response as illustrated in Figure 23.5. Basophils are also involved in allergy and hypersensitivity responses and induce specific types of inflammatory responses. Eosinophils and basophils produce additional inflammatory mediators to recruit more leukocytes. A hypersensitive immune response to harmless antigens, such as in pollen, often involves the release of histamine by basophils and mast cells. Figure 23.5. In response to a cut, mast cells secrete histamines that cause nearby capillaries to dilate. Neutrophils and monocytes leave the capillaries. 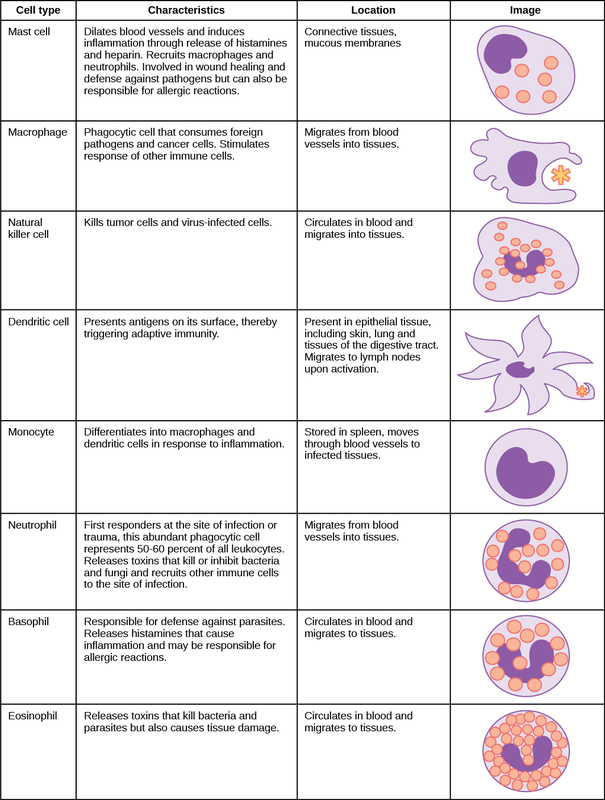 Monocytes mature into macrophages. Neutrophils, dendritic cells and macrophages release chemicals to stimulate the inflammatory response. Neutrophils and macrophages also consume invading bacteria by phagocytosis. 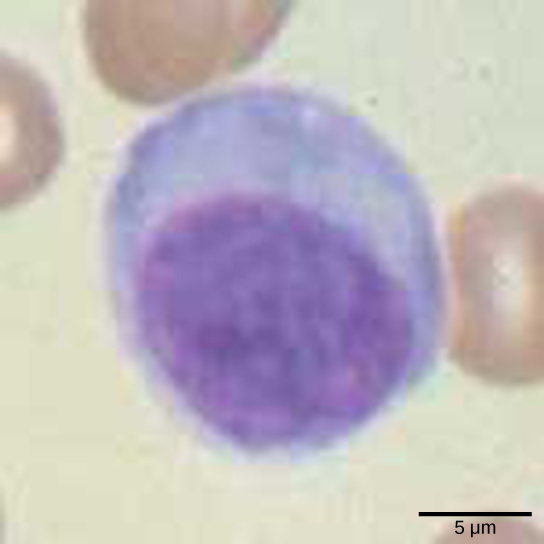 Lymphocytes are leukocytes that are histologically identifiable by their large, darkly staining nuclei; they are small cells with very little cytoplasm, as shown in Figure 23.6. Infected cells are identified and destroyed by natural killer (NK) cells, lymphocytes that can kill cells infected with viruses or tumor cells (abnormal cells that uncontrollably divide and invade other tissue). T cells and B cells of the adaptive immune system also are classified as lymphocytes. T cells are lymphocytes that mature in the thymus gland, and B cells are lymphocytes that mature in the bone marrow. NK cells identify intracellular infections, especially from viruses, by the altered expression of major histocompatibility class (MHC) I molecules on the surface of infected cells. MHC I molecules are proteins on the surfaces of all nucleated cells, thus they are scarce on red blood cells and platelets which are non-nucleated. The function of MHC I molecules is to display fragments of proteins from the infectious agents within the cell to T-cells; healthy cells will be ignored, while “non-self” or foreign proteins will be attacked by the immune system. MHC II molecules are found mainly on cells containing antigens (“non-self proteins”) and on lymphocytes. MHC II molecules interact with helper T-cells to trigger the appropriate immune response, which may include the inflammatory response. Figure 23.6. Lymphocytes, such as NK cells, are characterized by their large nuclei that actively absorb Wright stain and therefore appear dark colored under a microscope. Complement proteins perform several functions. The proteins serve as a marker to indicate the presence of a pathogen to phagocytic cells, such as macrophages and B cells, and enhance engulfment; this process is called opsonization. Certain complement proteins can combine to form attack complexes that open pores in microbial cell membranes. These structures destroy pathogens by causing their contents to leak, as illustrated in Figure 23.7. 1. Which of the following is a barrier against pathogens provided by the skin? 2. Although interferons have several effects, they are particularly useful against infections with which type of pathogen? 3. Which organelle do phagocytes use to digest engulfed particles? 4. Which innate immune system component uses MHC I molecules directly in its defense strategy? 5. Different MHC I molecules between donor and recipient cells can lead to rejection of a transplanted organ or tissue. Suggest a reason for this. 6. 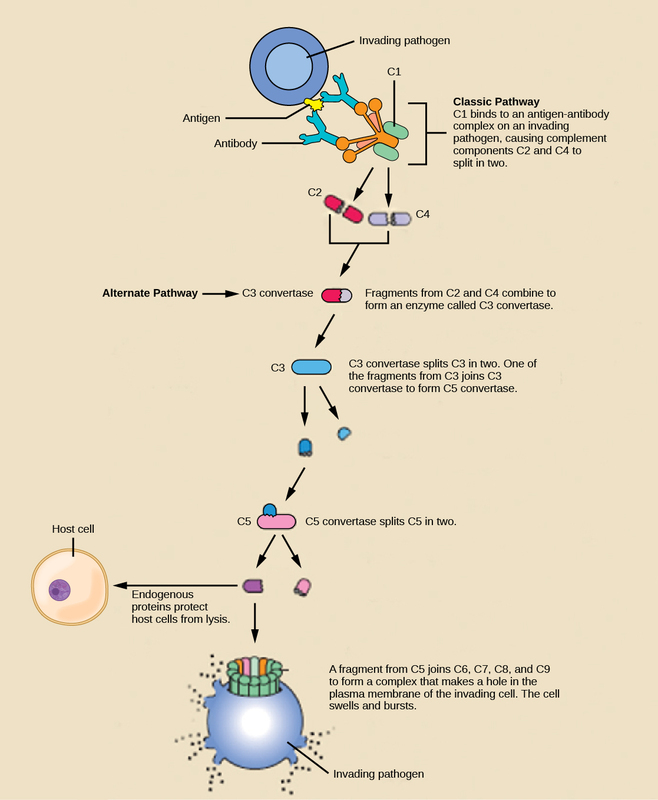 If a series of genetic mutations prevented some, but not all, of the complement proteins from binding antibodies or pathogens, would the entire complement system be compromised? 23.1. Innate Immune Response Copyright © by laesoph. All Rights Reserved.